When you need a break from the polluted city life, you can take a trip to the untouched beauty of nature to shower your heart with the wondrous simplicity. 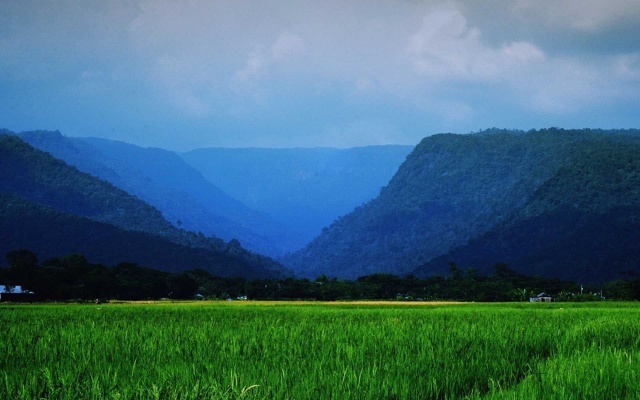 Bisnakandi in Sylhet district of Bangladesh is one such place to rejuvenate your spirit and morale. Take a trip to Bisnakandi, where layers of Khasi Mountain meet at a single point from left and right. The stream that flows on its rocky path down the mountain finally meets the beautiful Piyain river. The river itself passes between the layers of Khasi Mountain giving the landscape a beauty that is truly sublime! Bisnakandi can be one of the ultimate destinations in Bangladesh to break free from the mundane humdrum of city life. The stream that flows from high up the mountain carries boulders with it. In winter, though the river is tranquil and welcoming, but it’s when the boulders are deposited and mined. So it will not be a great time to visit Bisnakandi in winter. However, in rainy season, you will not get the chance to see the gentle stream of water flowing under huge boulders and colored rocks. The best time to visit Bisnakandi is during autumn (the middle of October); still, rainy season has a distinct charm to it, especially for more adventurous ones. The water of Piyain river is clear and fresh. You will see the river bed decorated with stones of different colors and shapes. Beware of the very slippery stones, especially if you have children with you. The hills make the landscape mystic and transcendental. During twilight, the mountainscape will blow your mind with the songs of cricket, and blinking lights of fireflies. But beauty is to see not to express, right? There are several spots on the way, where you may want to stop the car and take snaps. Once you reach Bisnakandi, take a boat ride in the Piyain River to reach the tourist spot. Enjoy the jaw dropping beauty sitting on a boulder and feel the gentle stream touching your feet. Take a bath. Take snapshots. Bring a Bluetooh speaker and play some of your favorite music that matches the ambiance (River and Cyrus by Ananda Shankar come to mind). You may even go for bar-b-q, if you are equipped with all the items. The best place to stay in Sylhet on a vacation is unquestionably the Nazimgarh Wilderness Resort. If you are staying there, it will take you about 2 hours (43 kilometers distance) to reach Bisnakandi. Start at dawn and stay till dusk if you are traveling to Bisnakandi with friends. If you are traveling with family (and children), plan to stay on site for at least 3 hours. Remember, it takes you about 2 hours to reach Bisnakandi from Sylhet or Nazimgarh Resort. The best hours in Bisnakandi, in terms of the sun, the heat, photo shooting, and comfort are 7am to 10am and/or 3pm to 5.30pm. There’s no good facilities at Bisnakandi for either food or accommodation. The only restaurant on site is poor in condition and the food they offer is not so tasty either. The restaurant has a toilet facility (very poor in condition) which you can avail by paying taka 5 or so. However, during high noon, the restaurant will give you some shed to hide from the sun and perhaps some cold drinks to quench your thirst. Chips, cookies, beverages and water are available at stalls and at the restaurant but are slightly overpriced. If you are planning to stay at Bisnakandi for more than 2 hours, bring food, drinking water with you. From Sylhet city or Nazimgarh resort, rent a private car to Bisnakandi. It usually costs around taka 2000 for transportation plus 3 hours of stay at site. The cost goes higher for longer stay. Bisnakandi is not a suitable place for traveling with kids under three years of age. Take food, beverages with you. You may eat at the on site restaurant, but the food doesn’t taste well, and its overpriced. Be careful of the rocks on the bed of the stream when seeking a good place to take snaps or just to sit and relax. They are very slippery. Pay extra attention to your children’s movement. Also, Indian Boarder is very close. Do not go near the border pillars and be aware of Indian BSF. Do not travel to or from Bisnakandi at night. The road may not be in good condition.